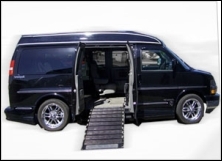 Handicap van conversions are vehicles tailored to fit the needs of the disabled. Most of these vans come with scooter accessibility and wheelchair conversion. You can convert your vehicle to fit most any size wheelchair or scooter. Disability vans are important for handicap individuals because they come with a rear and side entry along with wheelchair lifts and ramps. This makes it easier for the handicapped to be lifted in and out of the vehicle without ever having to be taken out of their wheelchair. Most of the time, family members or caregivers can have a hard time lifting a person in and out of their wheelchair. This also goes the same for scooters. Since the vehicle is relatively higher than the wheelchair, it can cause strain and stress on the person’s back who is doing the lifting. In most cases, there is only one caregiver or family member who may assist the handicap. Handicap van conversions can save anyone time and effort by being able to lift the disabled person without ever having to physically move the patient in and out of the vehicle. Sometimes, the van may have a lifter or crank. This is when the wheelchair or scooter is driven on a platform as it is raised and then rolled into the sitting position. In some cases, there will be a ramp that lies on the ground. The handicapped person can then drive their scooter or wheelchair directly into the vehicle on an elevated slope. 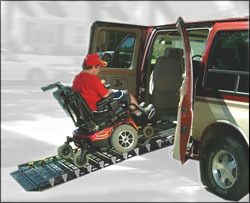 There are different entrances to handicap van conversions. The most popular is the rear entry wheelchair van. Most of the time, they have a sloped ramp for the wheelchair to be driven or rolled into the vehicle. Some of the vans come with custom-molded plastic panels along with a ramp design. Most of the handicap ramps can be folded and made from powder coated aluminum. Assistance handles are added in order to make operating the ramp a lot easier. For the seating, chairs can be flipped and folded. When they are being used, there is still a nice amount of room in the rear area for another passenger who may also be in a wheelchair. Newer handicapped equipped vehicles come with rear suspensions, making the ride smoother and less bumpy for the passenger. The rear entry vans are better for parking as well, especially if the vehicle is in a cramped spot where cars are close together. Tie down tracks along with a belt system secures the wheelchair or scooter into place. In addition to the rear entry and side entry door conversions of the van, you can also convert the insides of the vehicle. Lower Floors – Lowered floors allows for easier ramp access from the ground to the entrance. 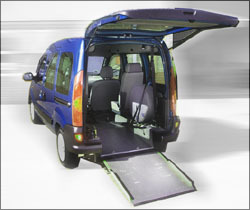 Wheelchair Van Lifts – Raises the wheelchair or scooter so they can be placed into the vans with ease. Wheelchair Ramps – Allows the individual to roll into the handicap vans by themselves or with the assistance of a caregiver. Handicap Hand Controls – Allows the driver to use only their hands to control the acceleration and braking without the use of their legs. Wheelchair Restraint Systems – Locks the wheelchairs in place so when the minivans hit bumpy terrain, the wheelchair individual can remain in one safe spot. Transfer Seats – Helps those who are driving or sitting in the passenger seat by simplifying the wheelchair to van seat transfer. If these are the van conversions you are interested in, find a reputable dealer to assist you in this process and get a conversion van price guide. It can cost anywhere from $10,000 to $15,000 and up for a fully converted van. Used van conversions will be cheaper but they may be 10+ years old and have many miles racked up. When looking for used handicap vans, a good measure to follow is to buy only those 3-5 years ago. Older van and minivan models have parts that will be difficult to find if you ever need a replacement.